The advanced TSD with PFZ is only supported by the Apache AH-64D Longbow. A real TSD with a TADS imagery underlay and a PFZ. This is about priority fire zones (PFZs), displayed on the Apache's TSD screen. PFZ is a way to quickly mark zones in an (engagement) area. The TSD combined with PFZ functionality makes it a very powerful tool to use. PFZs and NFZs are contrary. While the first is to mark priority engagement zones, the last is to mark non-engagement zones. NFZs are useful if you know the position of friendlies or civilians to make sure they are not targeted. 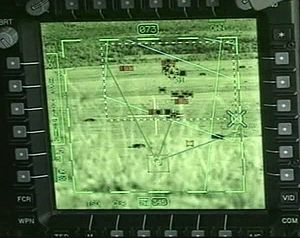 PFZs and NFZs only affect ground RADAR target selection. Mind that other targets will still be selectable with TADS, HMS or air RADAR. Regardless of the PFZ/NFZ status. You can have a maximum of 16 PFZs and 4 NFZs. If you create more, the oldest will be deleted. You can also manually delete PFZs. NFZs cannot be deleted. You create a PFZ by dragging the left mouse button in the TSD screen. To create an NFZ you do the same, but use the right mouse button when dragging. The TSD showing 2 PFZs and 1 NFZ. When a PFZ is created it will become the current PFZ. To cycle through PFZs, use the numpad Del key. To use PFZs, ground RADAR has to be activated. You will only be able to select targets inside the current PFZ. You can also use the ability of the ground RADAR to prioritize threats. 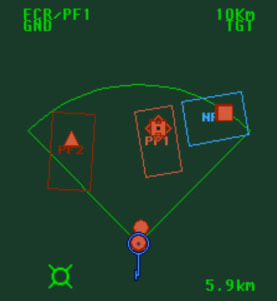 Each time you fire one missile, automatically the next target will be selected (inside the PFZ). In LOAL mode the Hellfire is able to climb 1000ft obstacles provided the peak is at least 1500 meters away. Keep firing missiles, until all targets have been fired upon. The Del represent the numpad delete key. MB represent a mouse button. This page was last modified on 3 February 2008, at 15:25.